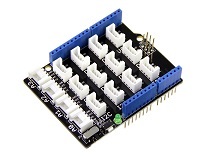 The Grove - 16-Channel PWM Driver is based on NXP PCA9685, which is a 16-Channel, 12 bit I2C PWM driver. 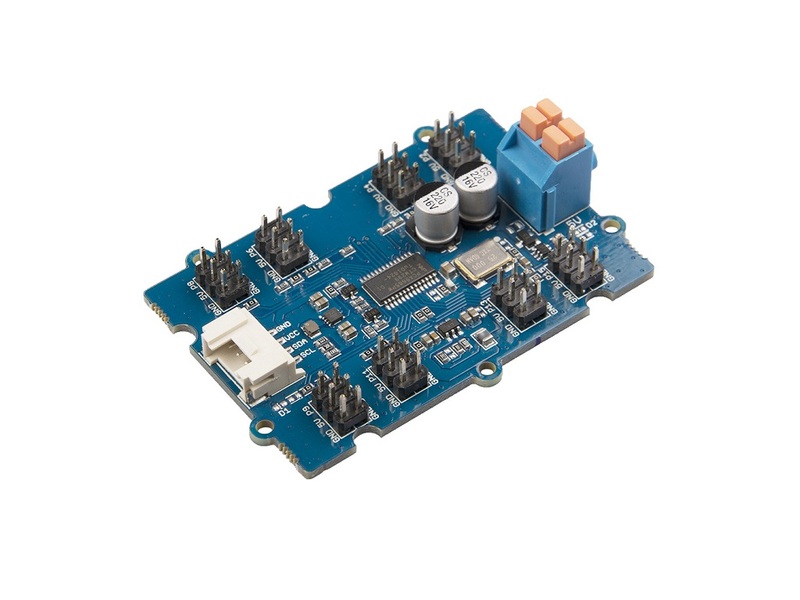 This board can drive up to 16 servos with the external power supply. You can control this board with Arduino easily via the I2C Grove interface. In addition, you can use this board as a LED controller. Hot swap is not supported, you may want to disconnect arduino from the power source before any replacement or change. 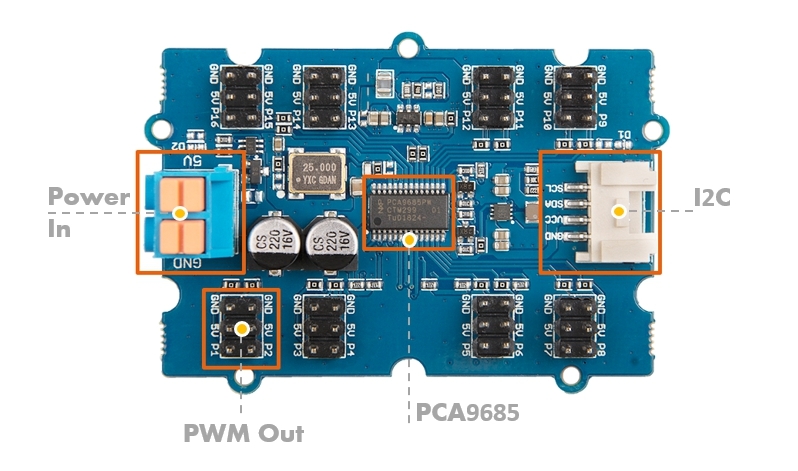 This board uses the I2C interface to allow the on-board MCU to communicate with the host computer. 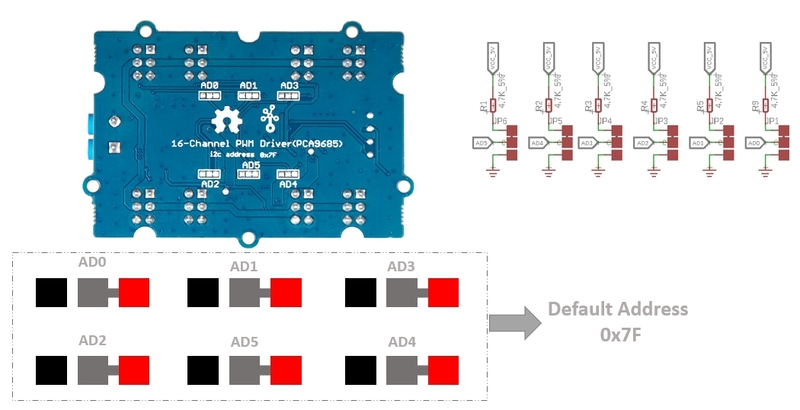 Provide 5V DC power for the servo. 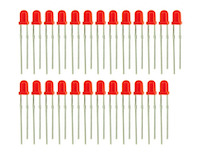 There are 16 groups of Pins(1 - 16) on this board, each group of pins contains one PWM signal pin, one 5V power supply pin and one pin for ground. The 6 selectable pads on the back of this board, all have 64 optional I2C addresses. The address consists of 7 bits and the highest bit is fixed at 1. When we are converting the address to a hexadecimal number, we need to add a 0 to the left of the highest bit. So the default address is 111 1111, when we add a 0, it becomes 0111 1111 which is 0x7f. And if we connect all the address pads to the ground, it turns to be 100 0000, when we add a 0, it becomes 0100 0000. Which is 0x40. 3 You also need prepare at least 2 jumper wires, in case you do not have, you can click here to buy. Step 1. Connect red LED to GND and P1 by using dual-female jumper wires. Step 2. 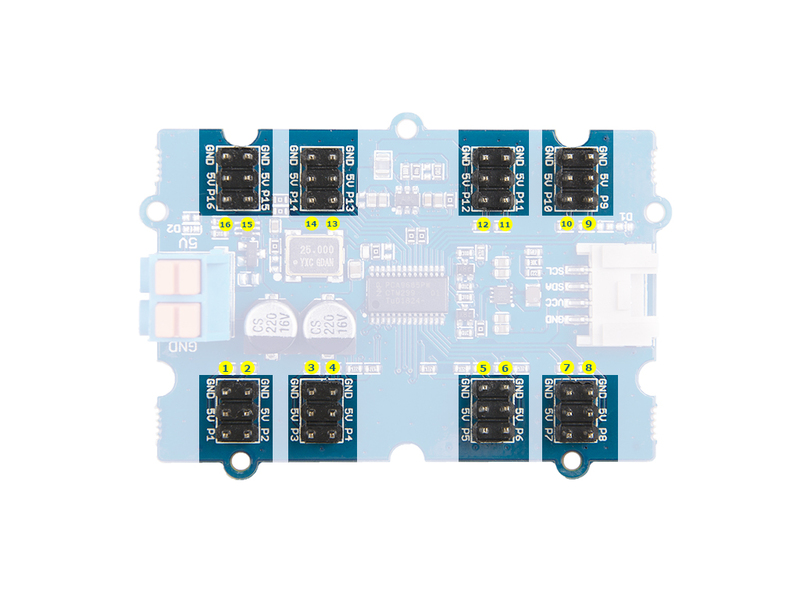 Connect the Grove - 16-Channel PWM Driver to port I2C of Grove-Base Shield. In this example for LED, as we are not using pin '5V' in output group we do not need to power up the power input port. 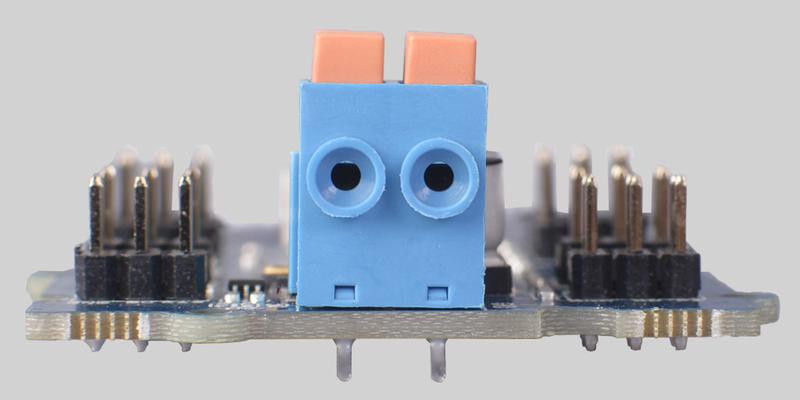 If you want to use servo, you need to connect the 5V pin to the power pin of servo, and you need to offer external power for Power In port. Step 1. 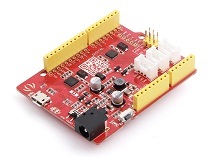 Download the Grove-16-Channel_PWM_Driver-PCA9685 Library from Github. Open it directly in the Arduino IDE via the path: File → Examples →Seeed_PCA9685 → led. Open it in your computer by click the basic_demo.ino which you can find in the folder XXXX\Arduino\libraries\Seeed_PCA9685\examples\led\led.ino, XXXX is the location you installed the Arduino IDE. If everything goes well, you will be able to see the LED goes on.